Ah that “new RV” smell. The aroma of a brand-new trailer, motorhome or truck camper can be intoxicating during the buying process. Unfortunately the scent wafting from the toxic formaldehyde glues holding the units together can also be bad for our health. Today a new generation of eco-smart RV manufacturers are trying to limit our exposure to toxins in RVs. They’re going for the Green RV certification process and attracting more savvy, eco-conscious buyers in the process. Here’s how they do it. Airstream Class B coaches are TRA Green Certified. RV manufacturers have often used less than eco-friendly materials to build their homes on wheels. Formaldehyde is the most well-known controversial RV material included in the fabrication process. This is a known carcinogen found in glues that hold wood products together. It’s also the key ingredient in that “new RV smell” and one of the reasons why RV manufacturers were thrust into bad press about it a few years ago. That’s when hundreds of Hurricane Katrina evacuees reported similar respiratory problems after moving into their temporary government-issued FEMA trailers. Over ten years later, the RV industry is striving to recover from this bad press by aiming for Green RV Certification from third-party evaluators like the Elkhart Indiana-based TRA Certification Incorporated. TRA has certified green RVs for nearly a decade. 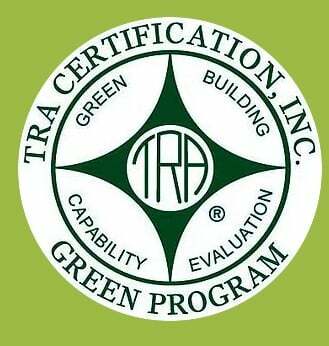 TRA Certification Incorporated is an independently owned organization that works with RV and modular/manufactured home producers who voluntarily strive to incorporate green practices into their business models. Are the RV’s wood materials “CARB compliant”? The “CARB” acronym refers to a standard set by the California Air Resources Board ruling that limits formaldehyde emissions from composite wood products. Is the RV made with low VOC materials? VOCs are the byproducts of toxic building products that deteriorate indoor air quality over time. How does the manufacturer incorporate scrap material into the building process? Did the manufacturer use materials with over 50% recycled content? Did the manufacturer source major building components from a 500-mile radius? Does it have low flow faucets? Does the unit have a dry flush, incinerating or composting toilet? How does the manufacturer use recycled water during the testing process? Are the appliances energy efficient? Does it have a solar electric power system? Manufacturers who go through the TRA Certification process can choose which areas they want to focus on in order to wear the “Green RV” certification label. However the designation is not without its critics. Environmentalists leery of of the Green RV certification process say that this system is too easy on manufacturers because it allows them to “cherry pick” the easiest features to tackle. On the other hand, RV industry insiders dispute that charge. “It’s nice for consumers to have the information in front of their face and can learn to expect these things from their ‘green’ RVs,” said Amanda Leazenby of TRA. “Some manufacturers who are not green certified call themselves ‘green’ and it is really unclear as to what they are doing. That can be very confusing to the consumer. They might think, ‘Oh, my RV is green,’ when in reality maybe the company just does something eco-friendly.” TRA’s goal aims to clarify what really makes an RV green based on today’s manufacturing processes. For now, many major RV manufacturers have achieved TRA Certification, including Airstream, Roadtrek, Coachmen and Forest River. To see all of the current green RV manufacturers and learn about the certification process, visit the TRA website.